Gustav's Eve. August 31. 10:35 p.m.
Jim Cantore of the Weather Channel is interviewing a family on board their fishing boat in Houma, Louisiana. 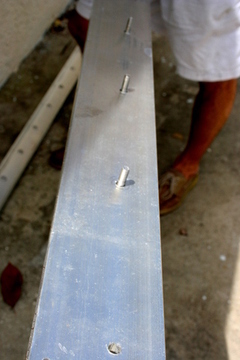 The family is planning to ride out Hurricane Gustav on their boat. I have my personal opinion on that, but I'll save it. What concerns me are the little children on the boat. One of them was a little girl of approximately three years of age, judging from her size, running around the boat as Cantore talked into the camera. Cantore, of course, is extremely concerned about the kids. Will someone please go track down this idiotic family and get those kids off that boat and out of harms way, or at least charge these brainless parents with child endangerment? I hope at the very least, she has a life jacket on! Update: I've been gone all day, just got home and overheard Rick sort of laughing at the TV, in that "shake your head" kind of way. He's pretty much glued to the Weather Channel, in between work around the house. He said that even though Gustav is hammering LA, there was a couple on the shoreline attempting to put a canoe in the water. The cops were on the scene, ordering them out. No word on the family from Houma, yet. I've watched Jim Cantore's broadcast a few times, but have yet to hear him mention it. And we're keeping an eye on Hanna! A windsurfer is pulled from his feet by the winds. 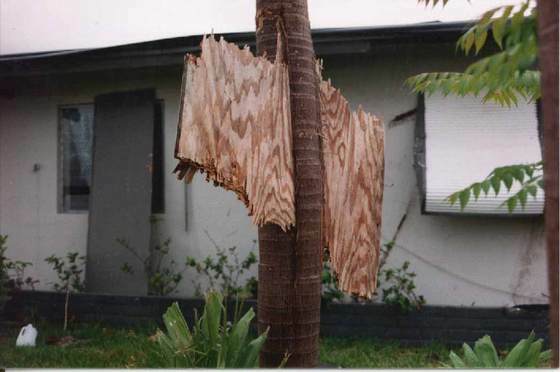 FORT LAUDERDALE - One South Florida man is learning a tough lesson: why you don't play with Mother Nature. A kite boarder was thrown through the air like a rag doll by some of the outer bands of Tropical Storm Fay. It happened around 5 p.m. yesterday in Fort Lauderdale. The man flew across the beach, and then across a busy street. Fort Lauderdale Fire Rescue says he was critically injured. Wind speeds at the time were between 35 to 55 miles per hour. Go Away Fay, the Rays Wanna Play! We went to the Ray's game tonight with Rick's brother, his wife and my all-county superstar, softball playing niece, who wanted to take in a Ray's game while visiting her Dad. Well, she WAS all county. Then she graduated from high school down in Miami and is off to college now. However, she is to baseball what ol Ansel Adams is to photography. She knows her stuff. And it was soooo good to get away from all the Fay-related hoopla, especially from Fox13, which is ramming it down our throats. They're going to start programing at 4 a.m. tomorrow, in case you missed the thunderstorm down the block. 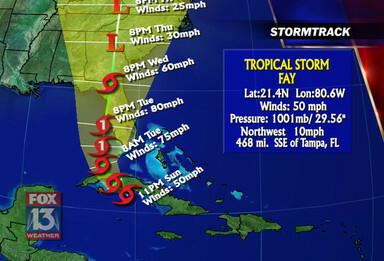 Fay is a tropical storm that may become a Category 1. The way Fox13 is carrying on, you'd think we're due for Armageddon. Our guests tonight were Andrew veterans, who have lived in the Keys and Miami and weathered several hurricanes since that really nasty day back in 1992. They seemed to be amused by all the commotion. I watched Fox13 whenever I was home during the day. I'd switch to other networks, but they would have their normal programming on as scheduled. This morning, I just wasn't sure what Fay was going to do. Spaghetti models were predicting different paths. So I kept the TV on the one local station that was tracking it closely. But when I'd turn on the Weather Channel, they seemed, above all, calm. We kept a concerned eye on the storm at various points during the day. We didn't panic to the point that we felt the need to go buy 2 weeks worth of groceries. Fox would show scenes from Charlie, over and over. 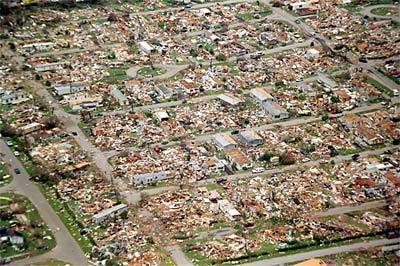 Charlie was a Category FOUR with winds of 150 mph at its peak intensity. Fay is not Charlie. Not unless she has a hissy fit overnight and ups the ante. And if she does, I'll print up this post and eat my words. I can understand the urgency to warn the citizens to ensure their safety, but I can't help wondering about Darwin's law in action at times. The elderly couple who can't get out of harm's way in time is to be excused. The stubborn old bats who won't leave their homes when told to evacuate, who then endanger the lives of the rescue personel called in to help them... well, I'll just stop with that line of analogy right here. I tried to understand Fox's reasoning. What do you do when you have a state with new residents moving in every day? They need to be warned and shown how to prepare. Then there are the younger folks, 18-20, for example, and on their own for the first time. They may need to know what to do. People need to know their evacuation levels. They need to know their county emergency status. On and on. Yet the overall feeling I got from Fox13 that I didn't get from other channels is: "Y'all are gonna GET HIT, BIG TIME!!" 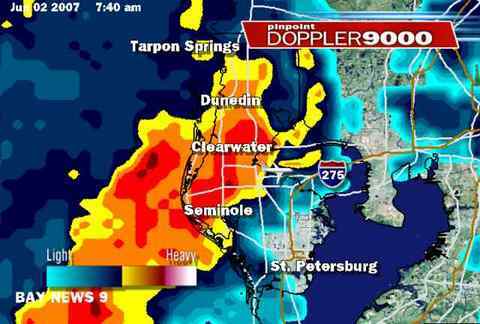 It looks like Pinellas county has dodged yet another blow, and I'm knocking on wood real hard at this point. This is the weather outside right now: No wind. No rain. No coastal flooding. It's been that way for 2 days. I'm going to have to turn on my sprinklers on my assigned "drought" day after all. And it turns out that the EAST side of the state is most likely to get the worst of the storm as they brace from the outer bands. Well don't that beat all. Just goes to show, you never can tell what these 'canes are gonna do. But I wish these TV weather announcers would lighten up when it's a TS and stop making it sound as if all hell is breaking loose. In any event, to those of you in Fay's path, I wish you well and above all, I wish you electricity. We're not in the mood for this one. It's likely to be just a major rainmaker. Confession time, I really ought to go through the hurricane kit. I think the stuff is scattered around the garage. And bring on the lectures, I can take it. gah. Another thought, if she flies past here on Tuesday, well... that's the first day of school for us. What a hassle that is going to be. My in-laws, down in Miami, ain't happy about it either. A nuisance storm, she is. My nieces and nephews will probably get off from school, so they'll be happy campers. Guess it's time to stock up on the canned foods again, hmm? Looks like the season is heating up! 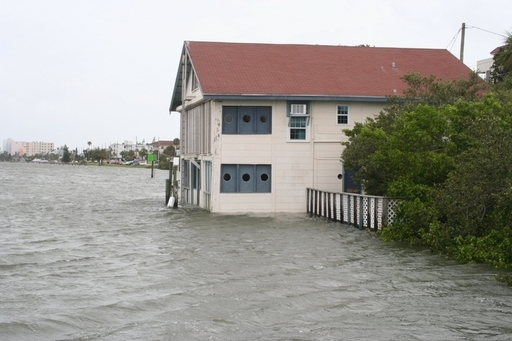 Here's a brave house that sits on the Intracoastal Waterway in Indian Rocks Beach on the Gulf Coast of Florida. I took this from the boat as we went past it, sometime back in 2004. The house has always fascinated me because of how close it is to the water. Behind this house is the two lane Gulf Blvd, and on the other side of that is the Gulf of Mexico. Here's the way the house looked in 2005 after Hurricane Dennis went up the coast. The house has been there a long time. It had to have been built long before code restrictions set in. I'm not sure if anyone lives there; it seems to be a vacation home. Every year thus far has been a lucky year, that's for sure. As of 2007, it's still standing. 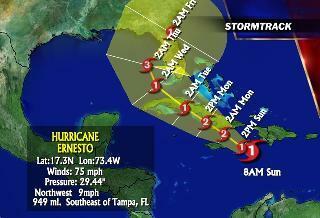 The power went out about 5:30 this morning, sort of a welcome into hurricane season whether we like it or not. Rick and I moved through the house with flashlights. I was craving coffee. Bad. He was supposed to leave for Miami at 5 a.m. to help install his mom's new kitchen, but decided to wait for the squall line to blow through. Shortly before 7, the power came back on. Oh God, I love power. The house got hot and stuffy in a hurry. First thing I did: make coffee. If Lowes and Home Depot are open today, I'm going shopping for a decent battery operated weather radio. My mother- in -law in Miami recommended the type that has a built in TV. She said it was a bonus during the big storms. With the power out this morning, I didn't like waking up and not knowing exactly where the storm was, or what was going on out there. Soaked! Currently, we're sitting around, making phone calls, drinking coffee, watching the news and uh, reading blogs. A while ago, the wind was so strong, I picked up the cat and held him high into the wind. Then I let go and he went sailing down the street... Serves him right for spraying every which way he can. ok, save your letters. he's actually lying on his back on Sam's bed with his blubber spilling out to the sides, snoring the last of his 2 lives away. whoa, there's some lighting, I think I'll head out and save battery power. stay dry! Update 10:30 a.m.: Storm? what storm? The skies are clear, a gorgeous shade of blue. It's a beautiful day! Amazing how quickly things change. Early this morning, I wrote a post about the drought situation, and then headed out to get a move on with the day. Came home around 4 p.m., flipped on the TV, went in the kitchen to get a drink and noticed this big red radar on the TV screen. Turned around and went back in the family room to stare at the TV. All of a sudden, here's Barry. It's odd, we're actually welcoming a tropical storm for a change. Take it easy, Barry. Just dump the rain on us and save the tantrums, ok? Holy smokes. When I went to bed last night, all the spaghetti models were pointing toward the Louisiana coastline for Ernesto's landfall. Got up this morning and turned on the news while making coffee, in time to see Fox13 weatherman with a graph like this and the warning on the screen, "Right Turn Expected, Review or Make Your Hurricane Plans Now!" I hadn't even had my first sip of coffee, dude. That's exactly what Katrina did. I went to bed after she had crossed over the Keys and she was a cat 3. Woke up the next morning and... well, you know the rest of the story. So I don't trust Cat 3's. I'm hoping this one will pass over Cuba because that will help weaken the storm. Pah. I ain't in the mood for this guy. I'm off to buy more supplies after I post this. We're stocked up on all the basics, but I'll need more food. a lot fo food. And two cat carriers. I only have one and I'd like to stick the little buggers in a carrier if we have to evacuate. Sam is a volunteer at the animal shelter here. I wonder what they'll be doing to prepare? Rick is in Tampa, left long before dawn for work. Wonder if he heard this on the radio yet. We'll find out. Sounds like he's in the roaming zone with the cell, so I left a message. It's pouring rain right now, just pourrrrrring. Folks, we're just not in the mood for this, huh? Take a look at this picture. Behold! Note the frozen ice inside the bottles. Folks, these two bottles are still frozen after having been in a cooler on the boat and on the beach, in the hot Florida sun, all day long, for a day and a half. I put them in the cooler Tuesday morning. They were still frozen Wednesday night. You might want to consider this as part of your disaster survival kit in the event the power goes out or if you need a good, heavy weight to use in case you ever need to whack a terrorist in the head. You'll need as many bottles as you can get for optimum cooling. I have 6 of these in the spare freezer and more in my hub's fishbait freezer. (The fish bait freezer bottles smell like old fish, so if the terrorist wakes up, the smell will make him pass out all over again. just thought you might need this handy tip). All kidding aside, these bottles work great during power outages. Two or three years ago, hub and friends went on an overnight fishing trip to The Middle Grounds, where they fished offshore, three hours from land, all night and all day in the hot, hot sun. They had filled 2 liter coke bottles with water and stock- piled them in the freezer in preparation. I think we had an entire freezer full of this type of frozen ice for months before they left. When they came home, I was surprised to discover that the majority of those bottles were still frozen. I would have thought the heat out on the gulf would have melted every one. Ever since, I've used this method when our power goes out during hurricane season. The Gatorade bottles are thicker and seem to last longer than the coke bottles. They don't crack as easily either. Fill them up 3/4 of the way and label it, this water isn't sterile. When some of it melts, you can pour ice cold water on your face, great for washing up when it's super hot outside! I line the bottom of one cooler with them and put the meat and other perishable food on top of it. That's the cooler that everyone has to stay OUT of, except during meal time. I use another cooler for the drinks, because that one is opened all day long. Note, we use BIG coolers to hold as much food as possible. Smaller bottles, such as the 16 and 32 ounce bottled water don't work as well with cooling because they are not as dense. They tend to melt much quicker as well. I freeze these anyway, and stick them in and around meats and cold drinks. 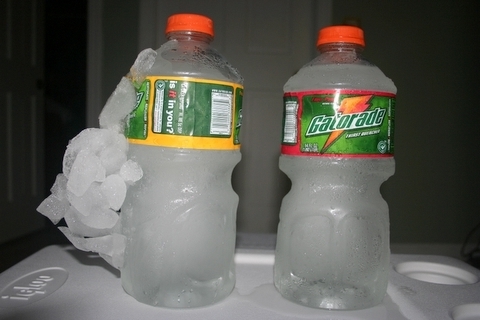 The Gatorade or 2Liter bottles also help keep your freezer cold when you're not using them in the cooler. Man, I love that song. It seems so fitting right now. Our home-owner's insurance bill arrived recently, all seventeen pages of it. We've had the same company since 1999 and I seem to remember when the bill itself was all of 4 pages long. This bill was peppered with warnings about what they would and would not cover. Rick and I will have to sit down and decipher it tonight. The language is insane. Last fall, they sent us a four page letter which carried the dire warning that "the language of your present policy is changing in some areas". Talk about doublespeak! It took a four page letter to inform us that "Land Stabilization and Building Stabilization" will not be covered under our policy. Do you know what that is? Land Stabilization? It's a sinkhole. They managed to avoid using the word "sinkhole" throughout the entire document. I was scratching my head, reading and rereading the entire letter to be sure. I just know they hired the President's speechwriter to draft the whole thing. Anyway, our new policy went up from $1256.00 in 2005 to $2067.82 this year. That's up from a mere $461. in 2003 and $681 in 2004. We have never filed a claim, nor had any damage to our house. If anyone had told me in 2003 that my homeowner's policy would go from $481 to $2000. within three years, I would have laughed. You're kidding, right? The policy also has a questionnaire that we can check off to get further discounts if we have a hip roof, and other types of construction and storm resistant barriers, so we'll have to fill that out this weekend and send it in. I'm sure they'll credit us a whole $10. for the bulk of it. We'll see. I suppose I can't complain. In Florida, if you mention how much you're paying for home-owner's insurance, you're likely to get shot down with a sarcastic "at least you HAVE homeowner's insurance!" So, you know... we'll keep this quiet. (except on the blog). But I wonder just how high these premiums will go over the years. And when is the legislature going to do something to stop these companies from charging exorbitant rates? You can't blame the policy increases on hurricane payouts; major companies are reporting record profits after the post 2004 hurricane season.... except for the badly mismanaged, state-run Citizens Insurance, which is in Total Shambles. I always did want a few horses and wide open spaces. But I wonder if the houses there have storm shelters from tornadoes and if the insurance company will cover that type of protective below-ground, "land stabiliation" feature. Just a thought, do the CEO's for these insurance companies live in waterfront homes??? It's summer and the girls are home from school. 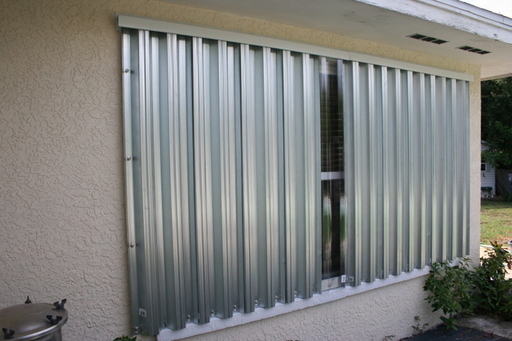 It's also hurricane season, and our Plain Plywood window panels are just so boring in their Bland Brown state. Britt and her friend got busy. The idea was throw darts to pop the balloons, but our darts were rubber tipped. We headed to the nearby Dollar Store to look for cheap, sharp instruments to throw, but they only had rubber tipped bow and arrows, rubber tipped pellet guns... you get the idea. There was not a sharp instrument in the STORE! Our laws are too strict! What happened to all the sharp, dangerous toys of our youth??! So we came home, and after I ruled out using steak knives, the girls settled for using ordinary pins. Definitely not as much fun. Next time, we'll head to Sports Authority and buy some decent sharp tipped darts. 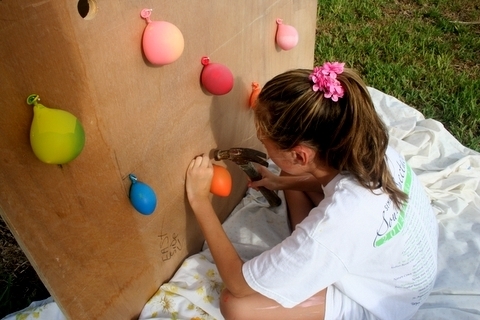 Not to be deterred, they popped all the balloons and began just squirting the wood with the paint itself. 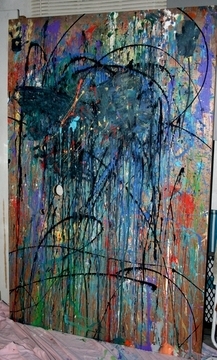 Is it not just so reminiscent of Jackson Pollock? 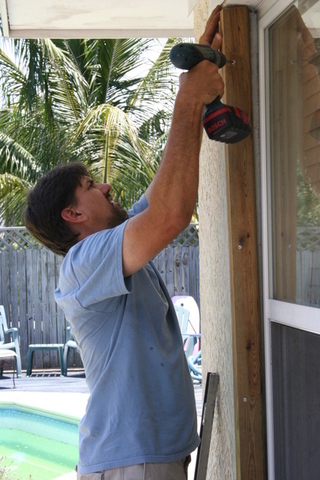 Our next set of plywood panels will be painted with various Florida sea side themes; and soon, we'll have the best decorated plywood panel house during hurricane season. Just in time for hurricane season comes this incredible foodie email, the likes of which will have you running for the grill with a plastic bag full of beaten eggs. It's for boiled omelets. I kid you not. The original email suggested that the eggs be used for "guests" at a party. I.E. "...have each guest add the prepared ingredients of choice to their bag and shake." They also have to write their names on the outside of each bag. Personally, I think whomever came up with this idea for a party had a few too many swigs of Mt. Gay Rum, but I'm all about opportunity here at VitaminSea. 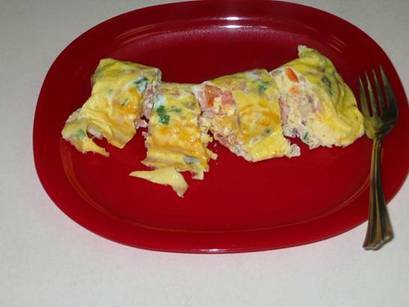 So I've declared the Ziploc Omelet to be the Ultimate Hurricane Food for those of you who find yourselves without electricity during the doldrums that follow a Cat3 or worse. Just get a pot of water boiling on the grill and have at it. So here's the recipe, and no, these are not my personal photos. I did not test this recipe and cannot, and (will not) vouch for its taste. You're on your own here, folks. 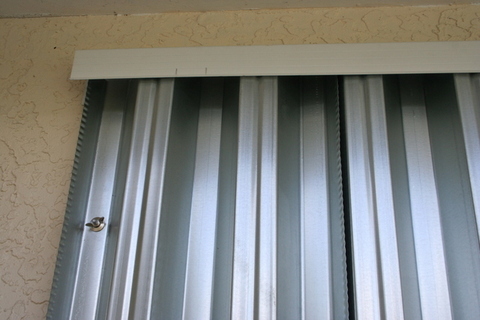 Just file this away for hurricane season, lest you be woefully unprepared. Have guests write their name on a quart-size Ziploc freezer bag with permanent marker. 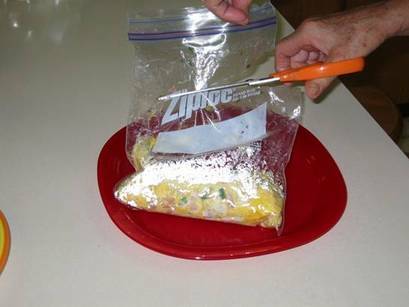 Crack 2 eggs (large or extra-large) into the bag (not more than 2) shake to combine them. Put out a variety of ingredients such as: cheeses, ham, onion, green pepper, tomato, hash browns, salsa, etc. Each guest adds prepared ingredients of choice to their bag and shake. omelets in a large pot. For more, make another pot of boiling water. Open the bags and the omelet will roll out easily. Be prepared for everyone to be amazed! My husband has been watching The Deadliest Catch on the Discovery Channel. It's his favorite show lately- the dramatic documentary of the crab fishermen on the Bering Sea. Folks, this is highly addictive television. One show, and you're hooked. It is Reality TVs answer to film noir; behold the dark ocean! Clawing and gnashing at the brave seamen, who stand (or try to stand) in defiance of the waves of wrath; just to bring you that juicy king crab at the Red Lobster. You better LIKE that crab, the next time you slide it through drawn butter with a squirt of lemon. Oh, for all they went through! I kid you not, this is scary stuff. The ocean will not back down, ever the conniving foe. It steals the buoys that hold the crab traps and sends them floating away, miles from their originating point, under massive sheets of unforgiving ice. And that ice... there is so much of it, think of the Titanic! That much ice (but without that awful Celine Dion song). During one major PMS session, the Bering Sea hurled forty foot waves at the Cornelia Marie, and later sent MORE ice! You will find yourselves on the edge of your seats to see if the Maverick takes in more crabs than the Northwestern. The crew members will become as familiar to you as your Uncle Joe. Many are father/son teams and you will find yourself with an urge to fix them a hot casserole when they come in from the bone chilling waters with claws still attached to their frozen noses. At the very least, you will want to buy them a beer! (phew! I was getting cold there, typing about all the ice and the noirsome sea). Thought I'd tell you all about the damage we sustained from Alberto. The back gate blew off the hinges and a ladder that was leaning against it fell over. It was a nice ladder and was found on the ground this morning. I'm going to contact FEMA about replacing the gate and the ladder and see if they'll get us a new trailer. We would like to go camping this summer and this beats taking out a loan for a camper. The girls want to go up to Tennessee and also see the new aquarium in Atlanta. We'll probably have to go down to Miami to get in line and fight off all the Miamians who didn't get aid from FEMA last year. <shrug> it's never too late to drop down in class. I was out on the beach around seven this morning. The winds are something else! Waves are high and the surfers will be out in force later on, that's for sure. I walked northward for about ten minutes and I don't think I've ever had a faster walk in my life; the wind was just pushing me along. Every so often, I'd feel a stronger gust and almost lose my balance! It was fun - as long as I faced North. Coming back was another story - the sand was airborne and my hair stood straight outward. I won't need to exfoliate my skin for some time, let's put it that way. There were a few people out there early in the morning, and most of them had windbreaker jackets. I wish I'd thought of that. Storm Veterans! I could tell we've had some beach erosion already. I wonder how the turtle nests fared? I saw more dogs being walked than ever before. That cracks me up, even Buddy didn't want to go outside last night and believe me, he had to GO- if you get my drift. I didn't take any photos because I didn't want to risk getting sand in the camera, it was already working it's way into every nook and cranny of my body and I do believe that sand boogers would have formed had I stayed out there much longer. Around the neighborhood, it just looks like we had a big rain storm, nothing more. Part of the privacy fence and the gate on our side yard blew off the hinges and is lying on the ground. Our neighbor got very lucky, they have an in-ground metal basketball hoop/pole set and it blew over, missing her car by mere inches. Shore acres, in downtown St. Petersburg had some flooding. That's near the bay. (what else is new? It always floods. I don't know why the news media heads over there every single time we get a storm. They all manage to make it sound as if it's a huge novelty). The sky is blue and everything looks very clean. 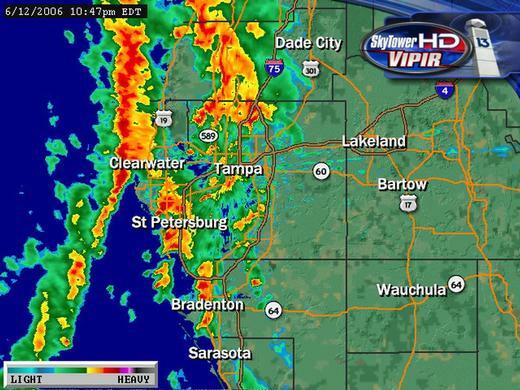 Here ya go, that's us right now, getting hit by a squall line moving through. We're about a mile from the beach, and the wind is incredible. I'm not expecting flooding in my neighborhood at all, as we're 35ft. above sea level and in a solid concrete block home. The noise, however, is incredible... squall lines are fairly noisy. 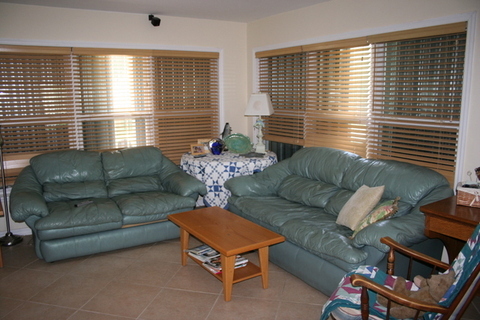 When you see the Weather Channel broadcast from Redington Beach in Florida, wave to us! I'm not too far away. :) I'll see if I can get over there tomorrow and get some photos. Locally, there is already flooding in parts of town in that always flood anyway. No surprise there. Tornado watches abound, every so often we hear some real freaky winds, but so far, so good! 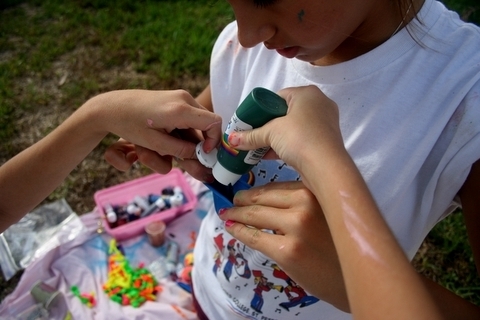 Pure Florida is also in the region and is part of an Community Emergency Response Team. His wife is a nurse on duty managing the storm shelters up there. Let's hope they come through safe and sound. Good morning. As you can see, we're getting soaked from Alberto. I'm not overly concerned about it at this point- just keeping an eye on the thing as it heads north. He's actually welcome in Florida right now. 175,000 acres have burned since January from wildfires, so the rain will be a welcome respite. At 8a.m. a tornado touched down near Winter Haven along highway 60 in Polk County. No idea if there has been any damage. 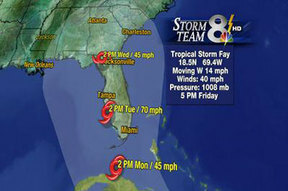 Some good websites for local TampaBay weather are TBO.com and Fox13. They'll have satellite, animated and Doppler images to view for different parts of the five or six counties in the Tampa Bay region. 'course, there is always the NOAA homepage as well. I headed into the front yard to clear away any debris that might be in their way, and came across the lone branch, sticking upright from the ground. Reached down to simply pick it up and toss it out of the way, but it was stuck fast and wouldn't budge. The guys came up behind me, struggling with the stinking carpet and trying not to yell at me to move. I pointed to what was blocking their way. Rick started to stomp on the branch, but it was stuck fast. He reached down and gave it a good yank, and in the instant it finally came lose, we all just looked at each other, somewhat in amazement. From the depth of how deeply it had been driven into the ground, we could just see first hand, the force with which it had flown into the ground without snapping. As if we hadn't seen enough already. I didn't know much about hurricanes in 1992. I think the whole country does now. More examples of force existed every where we looked. A pine tree lay on the side of his mom's house, even though there were no pine trees in or near her side yard. At a friend's house in the next block over, a ceramic roofing tile went airborne during the storm, flew through the air to another neighbor's carport, past their car, through their kitchen window and embedded itself inside the wall in their kitchen. 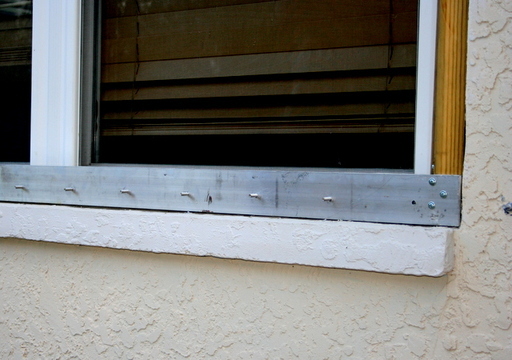 Still another neighbor's sliding glass doors shattered as wind entered the house, spraying glass shards over the walls and floors. They put sheets of plywood across the floors so they could walk across the room and marvel at what was left - a single statue left on a wall unit. Judging from what was left of the house, I don't think they'd have survived had they stayed in the house. I have a friend who lives near me who put her Lladro statues on her sofa during one of the hurricanes last year. She thought they would be cushioned that way and would not tip over. I'm not sure she thought about items that fly through the air, or mirrors that hang on the walls that come loose and fly every which way. I'm also sure she didn't realize that all the wind needs is the opportunity to get inside the house; and once it does, whole couches and tables can fly out of your home while the wind takes your roof and your insulation along with it. It still amazes me that people who live in coastal Florida will do certain things without really thinking about the outcome of these storms. Even with the message that Katrina left behind, they are still unprepared when a hurricane strikes. Witness the long lines for gas and food the day after Wilma hit, the very next day. What does it take to get the word "preparation" grilled into their heads? Every day for the past week, local news announcers on TV have urged us to begin making preparations now. The 2006 season starts June 1st. My dad has already been outside in the heat, cutting down trees in preparation. Hurricane preparedness lists are available online at this Florida disaster website, and just about every major newspaper and local news website. Federal Alliance for Safe Homes has a Resource Link Section here. 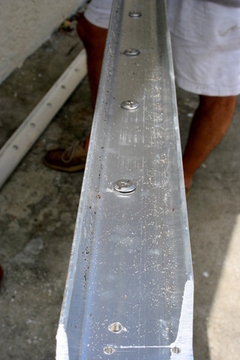 The Federal Alliance for Safe Homes has excellent information on retrofitting your roof and securing your house before a disaster. I also have several videos from Andrew. I would like to get them onto a disc so that I can pull some photos off of them. Tax free week ends soon, so get ready. As we move into this season I wish all of you the keys to self-sufficiency, foresight, mental sanity and a heavy dose of common sense. Good luck!